If there’s one thing just about every office could use, it’s more fun, right? Sitting in front of a computer for eight (or ten, or twelve…) hours a day just isn’t natural. For optimum mental and physical health it’s important to take frequent breaks. This mouse concept from Shih-Chan Chiu forces you to stop working once in a while and act like a kid. 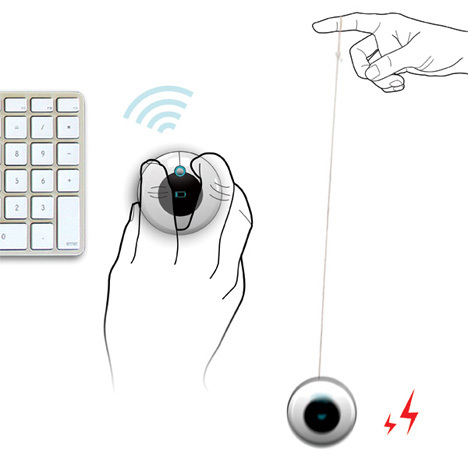 The Yo-Yo Mouse is just what it says: a wireless mouse that’s also a yo-yo. The round design looks way uncomfortable and frustrating to use, but we suppose that’s why you’ll be inspired to stop using it and stand up to play with it once in a while. 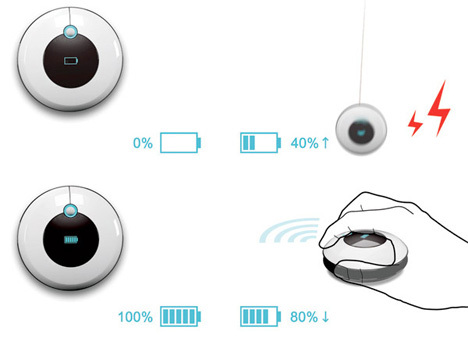 The fun part of this design (other than the fact that it’s a toy) is that it is actually charged by the yo-yo action. The more you play with it, the stronger the charge. Neglect your play time all day and you’ll soon run out of battery power. Then you have a choice: stand up and play with the Yo-Yo Mouse…or go find a regular mouse and use it instead. See more in Computers or under Gadgets. December, 2011.